Download "Ashby School. School and boarding report. 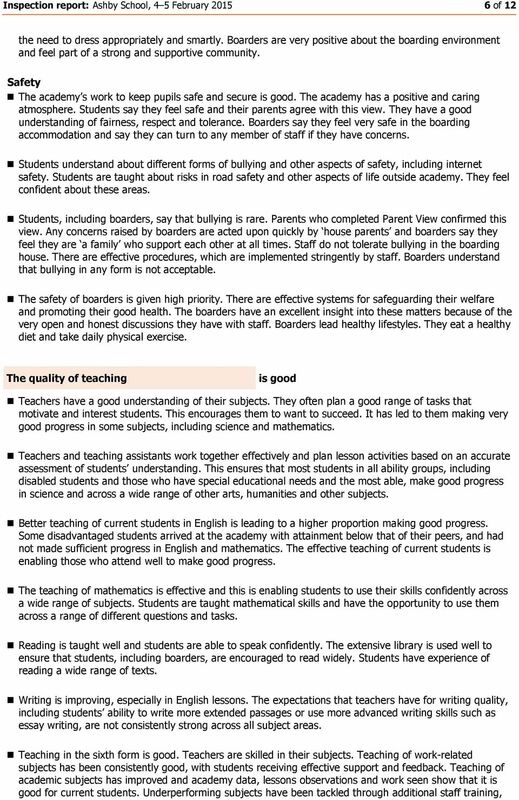 Summary of key findings for parents and pupils. Inspection dates 4 5 February 2015"
1 School and boarding report Ashby School Nottingham Road, Ashby-de-la-Zouch, LE65 1DT Inspection dates 4 5 February 2015 Overall effectiveness Previous inspection: Not previously inspected as an academy This inspection: Good 2 Leadership and management Good 2 Behaviour and safety of pupils Good 2 Quality of teaching Good 2 Achievement of pupils Good 2 Sixth form provision Good 2 Overall effectiveness of the boarding experience Outstanding 1 Summary of key findings for parents and pupils This is a good school. Good teaching ensures that students make good progress across a wide range of GCSE subjects, particularly mathematics and science. Teachers have a good understanding of their subject areas and are often effective in making students enthusiastic about their learning. Students behave well in lessons and around the two academy sites. Students say they enjoy being at the academy and feel safe. Parents agree. Students enjoy a wide range of extra sporting, musical and artistic trips and activities. 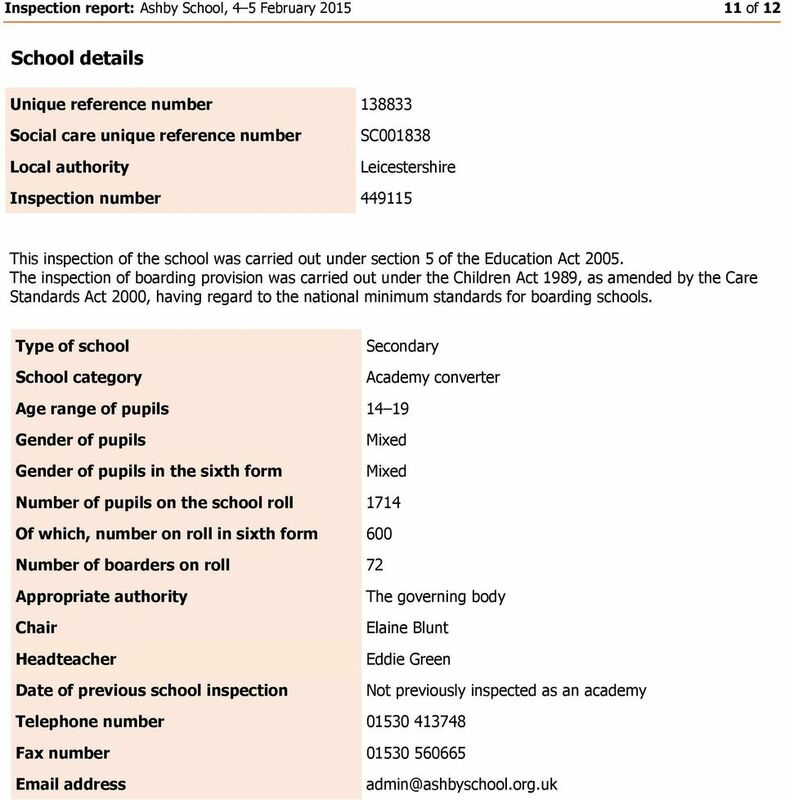 The academy meets the national minimum standards for boarding schools. 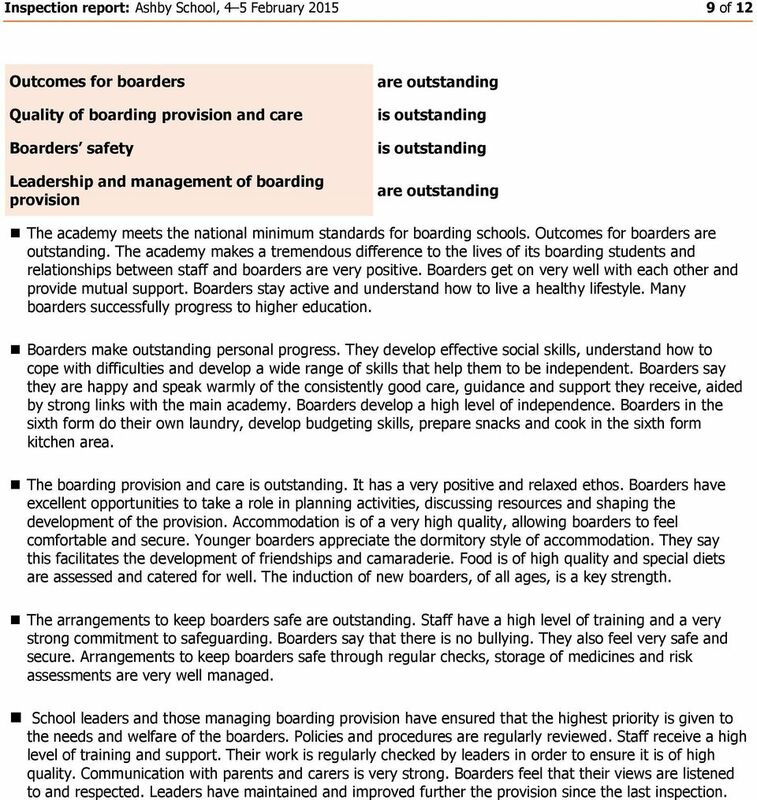 Most aspects of the boarding provision are outstanding. Sixth-form students make good progress in many subjects, especially those studying work-related options. Effective actions taken by leaders to address underperformance in a few subjects have led to current students doing consistently better. Leaders, including governors, have a good understanding of performance data. They have identified the key areas that needed improvement and ensured that staff focus on them. As a result teaching has improved, and this has led to better achievement for current students throughout the academy. It is not yet an outstanding school because Teachers marking and feedback to students do not always give them helpful guidance about how to improve their work. Students do not have sufficient opportunity to practise writing at length, or using advanced writing skills, in different subjects. A small number of students in Years 10 and 11 have still not caught up with their peers because they are not attending regularly enough. Until recently, leaders and governors have not kept a close enough check on the links between these students attendance and their progress. 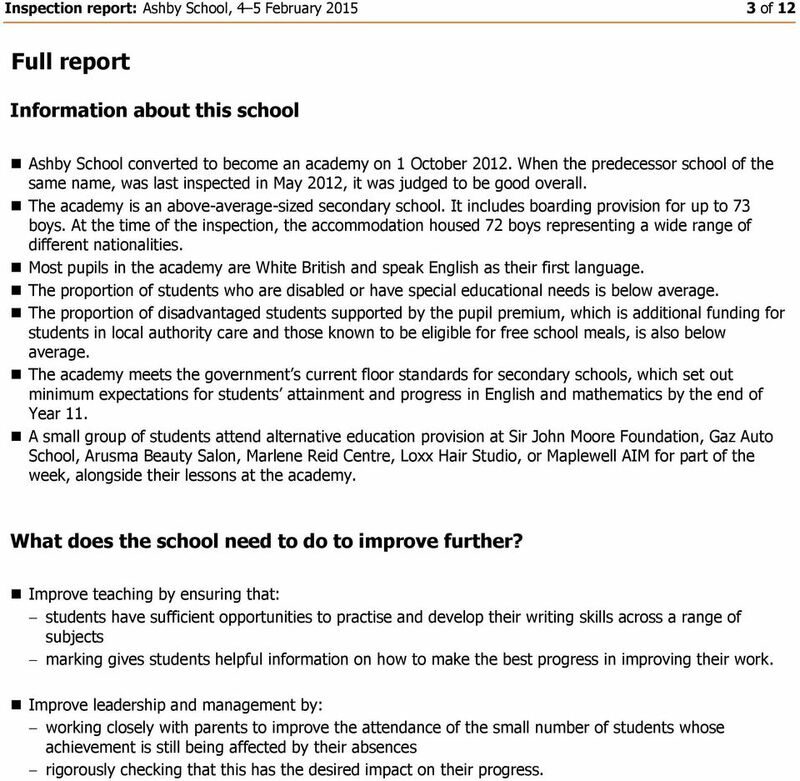 3 Inspection report: Ashby School, 4 5 February of 12 Full report Information about this school Ashby School converted to become an academy on 1 October When the predecessor school of the same name, was last inspected in May 2012, it was judged to be good overall. The academy is an above-average-sized secondary school. It includes boarding provision for up to 73 boys. At the time of the inspection, the accommodation housed 72 boys representing a wide range of different nationalities. Most pupils in the academy are White British and speak English as their first language. The proportion of students who are disabled or have special educational needs is below average. The proportion of disadvantaged students supported by the pupil premium, which is additional funding for students in local authority care and those known to be eligible for free school meals, is also below average. The academy meets the government s current floor standards for secondary schools, which set out minimum expectations for students attainment and progress in English and mathematics by the end of Year 11. A small group of students attend alternative education provision at Sir John Moore Foundation, Gaz Auto School, Arusma Beauty Salon, Marlene Reid Centre, Loxx Hair Studio, or Maplewell AIM for part of the week, alongside their lessons at the academy. What does the school need to do to improve further? Improve teaching by ensuring that: students have sufficient opportunities to practise and develop their writing skills across a range of subjects marking gives students helpful information on how to make the best progress in improving their work. Improve leadership and management by: working closely with parents to improve the attendance of the small number of students whose achievement is still being affected by their absences rigorously checking that this has the desired impact on their progress. 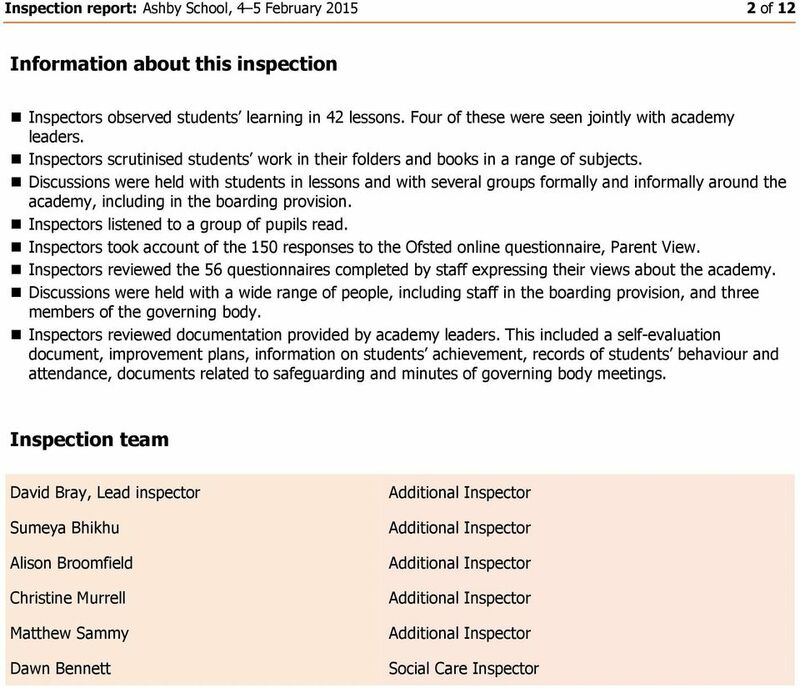 7 Inspection report: Ashby School, 4 5 February of 12 support or, in a few cases, being removed from the curriculum. Teachers are effective at checking students understanding and adjusting activities. Students have regular opportunities to discuss ideas together and this helps them to deepen their knowledge. Teachers often provide helpful verbal feedback for students. Marking and written comments are often good. However, some marking is not always regular or clear enough to help students improve their learning. Homework is used regularly to extend and develop learning. Students, including boarders, complete homework carefully and conscientiously. The achievement of pupils is good Students typically start at the academy with above-average attainment. The proportion gaining five or more GCSE A* to C grades, including English and mathematics, has been above average for each of the last three years. Their combined scores in their best eight subjects also demonstrate above-average progress. The academy entered some students one year early for GCSE examinations in mathematics. Despite this, their achievement in mathematics was above average because some later retook examinations. The academy has now stopped this practice because of changes in the way that these results are counted. The small number of students studying work-related and other subjects away from the academy site achieve well. They are improving their attendance, gaining appropriate qualifications and making good progress against the targets set for their attainment. There is no significant difference between the achievement of students from different ethnic backgrounds, including those who speak English as an additional language, when compared with others. The attainment of current boarders is below that of other students, but they have made good progress from lower starting points. The academy uses pupil premium funding for extra staffing, one-to-one tuition and additional educational resources for eligible students. Senior leaders have ensured that improving the progress and attainment of this group is a key priority for all staff. In 2014 disadvantaged students attained, on average, two GCSE grades lower than other students in mathematics, and one and half grades lower in English. They were also a grade behind other students nationally. Current academy progress data, lesson observations and a scrutiny of the work of current disadvantaged students shows that many are starting to attain better when compared to other students, in both English and mathematics. A few students are not and this is mainly because they do not attend well enough. The disabled students and those who have special educational needs currently in the school are mostly making good progress. As a group they did not make sufficient progress in 2014, and leaders rightly made improving their progress a priority. Effective work has been carried out to ensure that teaching assistants are trained well and provide effective support in lessons. Some students receive additional support and actions taken by leaders have resulted in many of these students currently in Years 10 and 11 making good progress. A small number are still not attending regularly enough to achieve as well as they should. The sixth form provision is good The sixth form is improving, and because of changes made over the last 12 months it is now good. Students taking work-related qualifications have made consistently good progress. Students taking A-level courses have previously achieved well in several subjects but not done well enough in others. There is better consistency now. As a result, progress improved in 2014 examination results, based on unvalidated data. 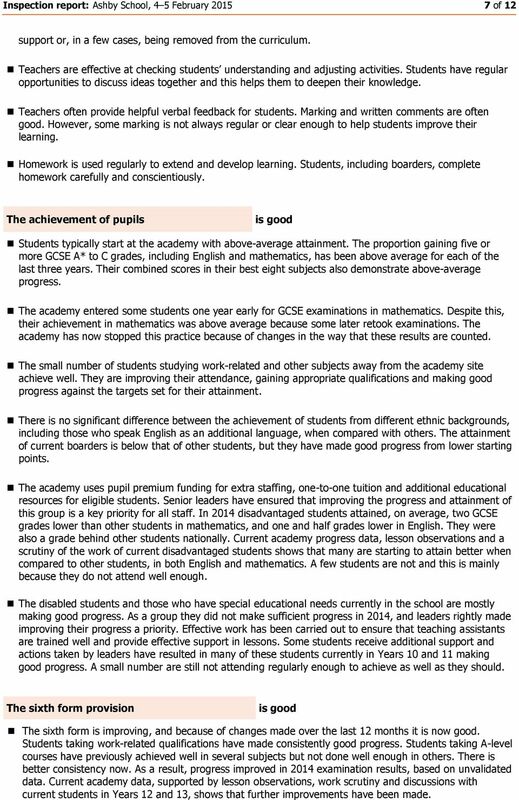 Current academy data, supported by lesson observations, work scrutiny and discussions with current students in Years 12 and 13, shows that further improvements have been made. 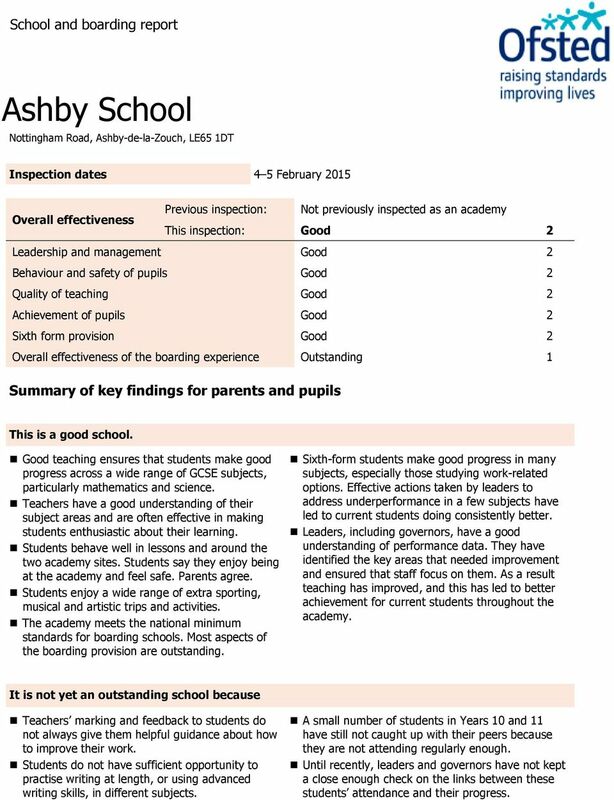 8 Inspection report: Ashby School, 4 5 February of 12 Provision for the most able students is good, and an increasing proportion of students are moving on to the highly regarded Russell group or Oxbridge universities. A high proportion of last year s students have taken up a place at university and almost all gained a place at their first choice. Almost all students start the sixth form with a GCSE grade C in English and mathematics. A small number do not, and they receive the necessary support to gain these qualifications. Disadvantaged students have not achieved as well as others in the past, but are currently doing better. Students attend well. They are positive about their experience and value the advice they receive from teachers. 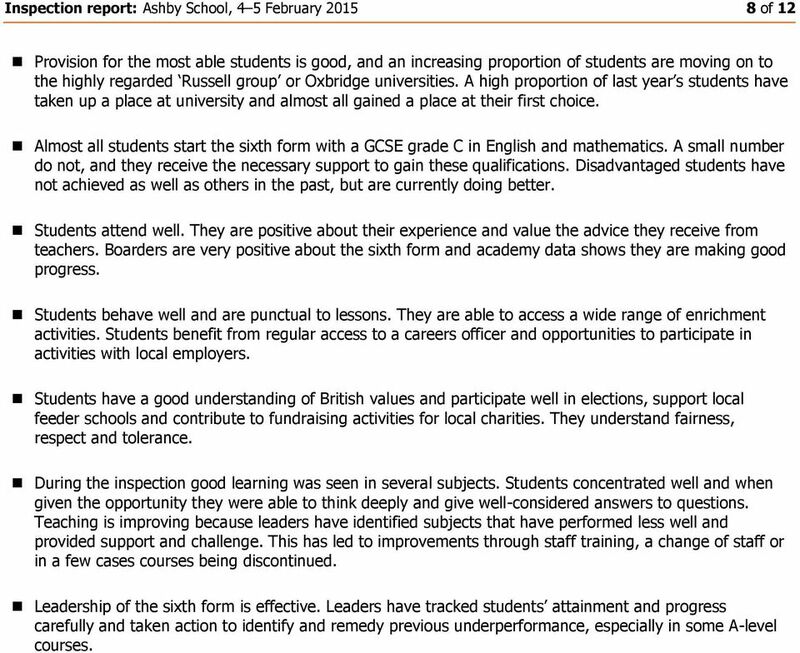 Boarders are very positive about the sixth form and academy data shows they are making good progress. Students behave well and are punctual to lessons. They are able to access a wide range of enrichment activities. Students benefit from regular access to a careers officer and opportunities to participate in activities with local employers. Students have a good understanding of British values and participate well in elections, support local feeder schools and contribute to fundraising activities for local charities. They understand fairness, respect and tolerance. During the inspection good learning was seen in several subjects. Students concentrated well and when given the opportunity they were able to think deeply and give well-considered answers to questions. Teaching is improving because leaders have identified subjects that have performed less well and provided support and challenge. This has led to improvements through staff training, a change of staff or in a few cases courses being discontinued. 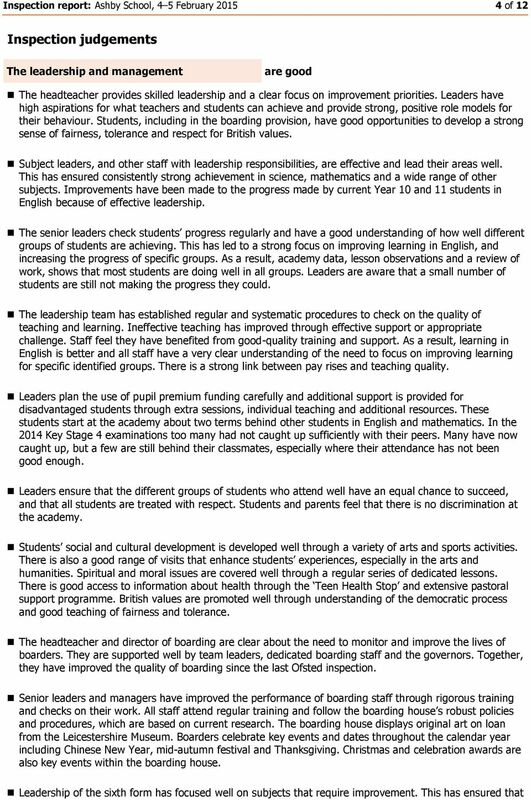 Leadership of the sixth form is effective. Leaders have tracked students attainment and progress carefully and taken action to identify and remedy previous underperformance, especially in some A-level courses. 9 Inspection report: Ashby School, 4 5 February of 12 Outcomes for boarders Quality of boarding provision and care Boarders safety Leadership and management of boarding provision are outstanding is outstanding is outstanding are outstanding The academy meets the national minimum standards for boarding schools. Outcomes for boarders are outstanding. The academy makes a tremendous difference to the lives of its boarding students and relationships between staff and boarders are very positive. Boarders get on very well with each other and provide mutual support. Boarders stay active and understand how to live a healthy lifestyle. Many boarders successfully progress to higher education. Boarders make outstanding personal progress. They develop effective social skills, understand how to cope with difficulties and develop a wide range of skills that help them to be independent. Boarders say they are happy and speak warmly of the consistently good care, guidance and support they receive, aided by strong links with the main academy. Boarders develop a high level of independence. Boarders in the sixth form do their own laundry, develop budgeting skills, prepare snacks and cook in the sixth form kitchen area. The boarding provision and care is outstanding. It has a very positive and relaxed ethos. Boarders have excellent opportunities to take a role in planning activities, discussing resources and shaping the development of the provision. Accommodation is of a very high quality, allowing boarders to feel comfortable and secure. Younger boarders appreciate the dormitory style of accommodation. They say this facilitates the development of friendships and camaraderie. Food is of high quality and special diets are assessed and catered for well. The induction of new boarders, of all ages, is a key strength. The arrangements to keep boarders safe are outstanding. Staff have a high level of training and a very strong commitment to safeguarding. Boarders say that there is no bullying. They also feel very safe and secure. Arrangements to keep boarders safe through regular checks, storage of medicines and risk assessments are very well managed. School leaders and those managing boarding provision have ensured that the highest priority is given to the needs and welfare of the boarders. Policies and procedures are regularly reviewed. Staff receive a high level of training and support. Their work is regularly checked by leaders in order to ensure it is of high quality. Communication with parents and carers is very strong. Boarders feel that their views are listened to and respected. Leaders have maintained and improved further the provision since the last inspection. 10 Inspection report: Ashby School, 4 5 February of 12 What inspection judgements mean School Grade Judgement Description Grade 1 Outstanding An outstanding school is highly effective in delivering outcomes that provide exceptionally well for all its pupils needs. This ensures that pupils are very well equipped for the next stage of their education, training or employment. 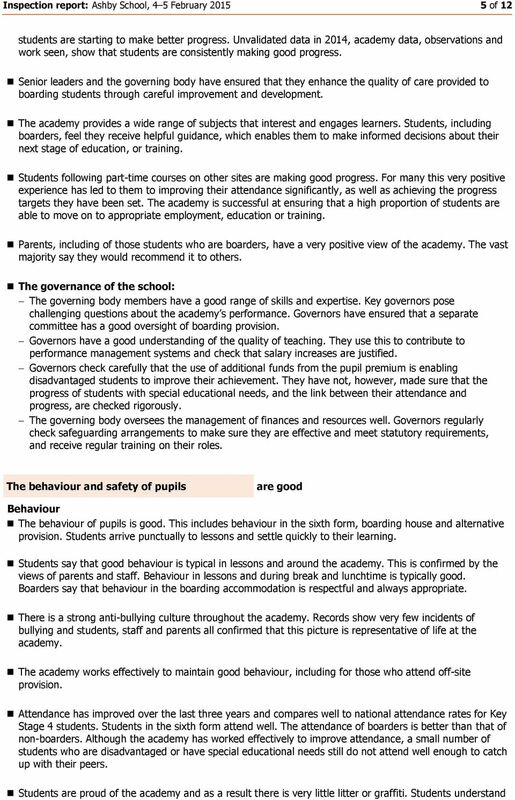 Grade 2 Good A good school is effective in delivering outcomes that provide well for all its pupils needs. Pupils are well prepared for the next stage of their education, training or employment. Grade 3 Requires improvement A school that requires improvement is not yet a good school, but it is not inadequate. This school will receive a full inspection within 24 months from the date of this inspection. Grade 4 Inadequate A school that has serious weaknesses is inadequate overall and requires significant improvement but leadership and management are judged to be Grade 3 or better. 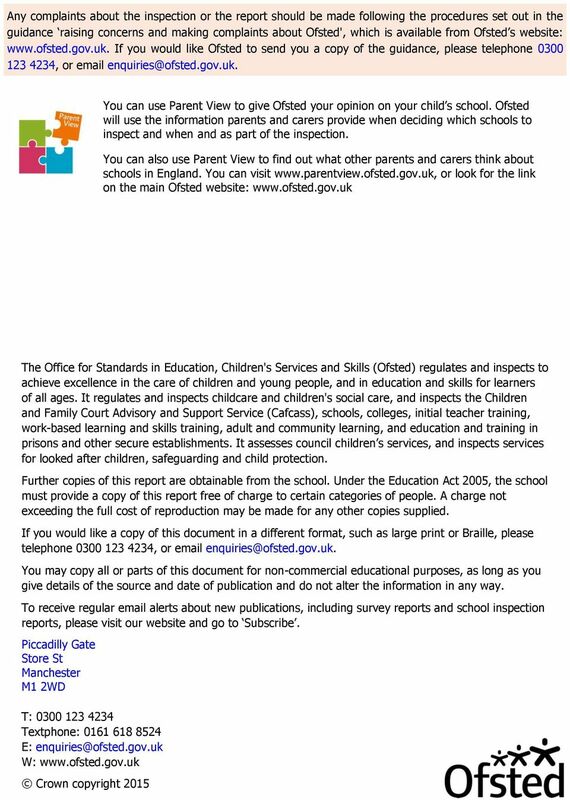 This school will receive regular monitoring by Ofsted inspectors. A school that requires special measures is one where the school is failing to give its pupils an acceptable standard of education and the school s leaders, managers or governors have not demonstrated that they have the capacity to secure the necessary improvement in the school. This school will receive regular monitoring by Ofsted inspectors. 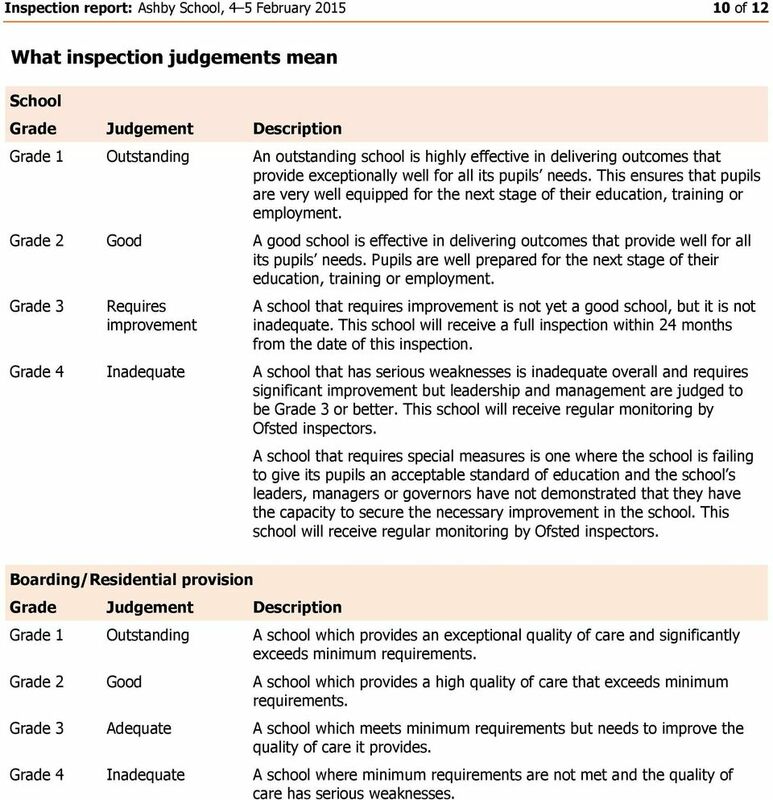 Boarding/Residential provision Grade Judgement Description Grade 1 Outstanding A school which provides an exceptional quality of care and significantly exceeds minimum requirements. Grade 2 Good A school which provides a high quality of care that exceeds minimum requirements. Grade 3 Adequate A school which meets minimum requirements but needs to improve the quality of care it provides. Grade 4 Inadequate A school where minimum requirements are not met and the quality of care has serious weaknesses.